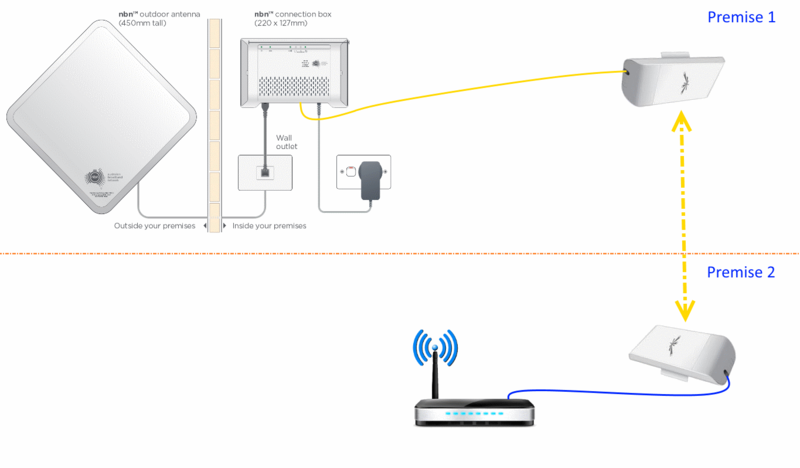 The following diagrams show typical methodologies for connecting a remote nbn™ fixed wireless installation via a WIFI link. The link is best constructed using semi-commercial specialist WIFI routers such as those made by Ubiquiti or MicroTik; or similar. This equipment is inexpensive and relatively straightforward to configure. 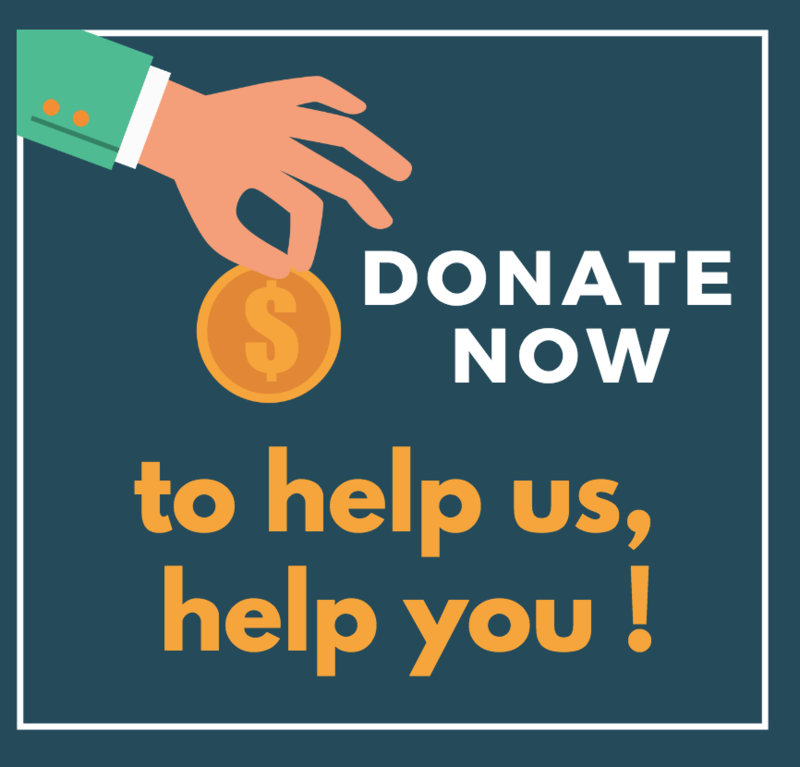 You may also be able to purchase the equipment pre-configured, depending on the application. City Technology is a good place to compare Ubiquiti product pricing. For links around 2 to 3Kms, an equipment cost of around $100 per site is likely. Installation and cabling is additional. Reliable links of up to 20Km may be economically realised. If the WIFI link is well designed and constructed it will provide speeds in excess of 100Mbps; which is more than fast enough for a 50/20Mbps nbn wireless connection. This arrangement is typical for a remote nbn™ installation in an area on your property, where signal is good. OPTION 2: The second arrangement shows an nbn™ fixed wireless service installed in Premise 1 with internet available. This internet service is extended via a WIFI bridge to another premise, Premise 2. Both premises share a single nbn™ wireless service. 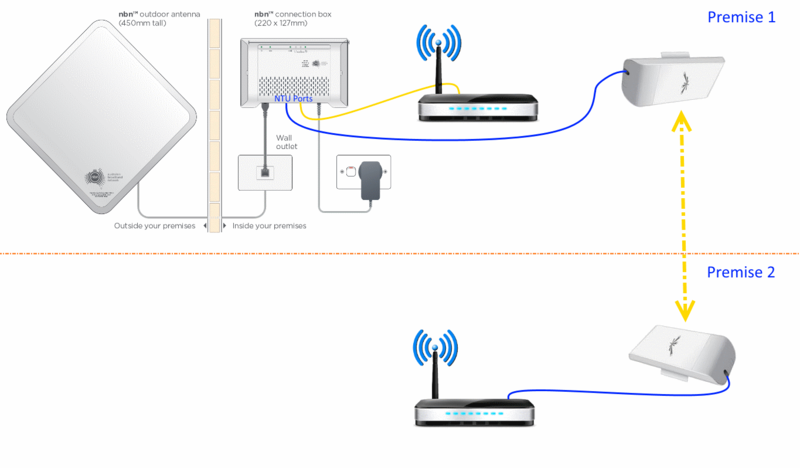 Depending on configuration of the routers the premises may or may not share the same network. You may also configure the router to ensure that one household doesn’t swamp the others access ie each household is restricted to half the capacity of the FW link. This configuration is most likely suitable for families living in separate homes on the same property, where the cost of the internet service is shared. OPTION 3: This arrangement shows an nbn™ fixed wireless service installed in Premise 1 with internet available. A second nbn™ fixed wireless service is installed on the same nbn wireless NTU using the same or a different RSP (ISP/Provider). This second service is extended via a WIFI bridge to Premise 2. This second service is independent of the service at Premise 1 and is likely, separately billed. This arrangement is most likely if you negotiate to use your neighbour’s nbn™ connection. There are two W-NTD versions. The V1 ODU has an antenna gain of 23dBi and a throughput capacity 60Mb/s. The V2 ODU has an antenna gain of 26dBi and a throughput capacity of 75Mb/s i.e. across one or all four ports. An nbn™ fixed wireless service is available with speeds of 12/1, 25/5 and 50/20 (up to). This implies that if both customers were to activate a 50/20 service then there would be times when the service speed is restricted (by the 60-75Mbps total cap), if they are both heavy users. Sharing between ports is graceful, as they are different vlans ie if you had port 1 and 2 activated with 50/20 plans, the throughput sharing would be 50:50. There will be other variations of these four themes. Please note, while all care has been taken in compiling BIRRR documents, we recommend that you check with nbn™ or your ISP regarding your own connection issues. 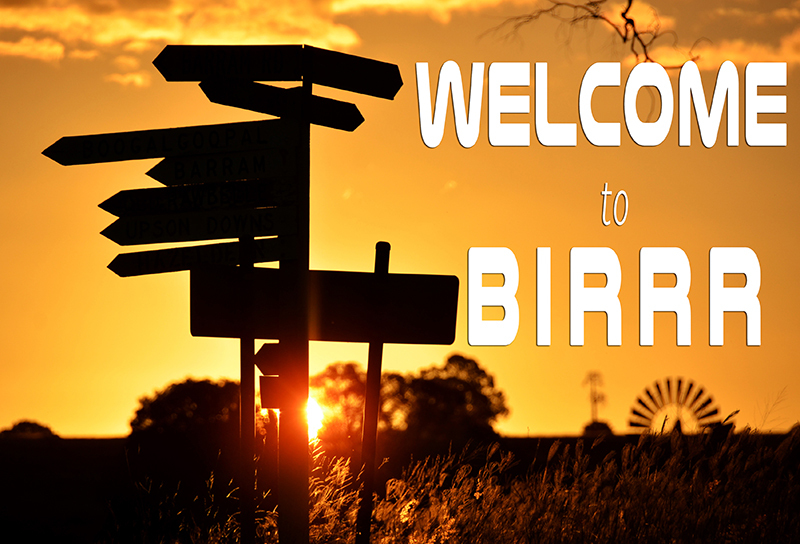 Thanks to John Kitchener, BIRRR member for compiling this document. Telco Antennas can do a desktop site survey to assist you with connecting to mobile broadband & determine if there is reception in your area (cost is $79). They can then put you in touch with a specialist in your area who understands the requirements for your state. The report will advise likely signal levels, the sort of mobile services available, the best antenna for your location and where to point your antenna. Thanks to Telco Antennas* also for providing the following information on antenna and aerial specialists throughout Australia. Please contact them directly for advice on equipment and the following installers. To find your closest antenna installer click here. BIRRR do not recommend self installation, please contact one of the professionals above.